Ken Nogami was born and raised in Hamilton, Ontario. He has been a violinist with Symphony Nova Scotia since 2000. 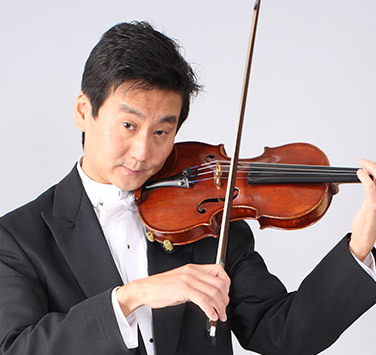 Ken studied at the University of Western Ontario (with Lorend Fenyves) and the New England Conservatory Boston (with Malcolm Lowe, Boston Symphony Concertmaster). He has played with various orchestras in the Boston, Southern Ontario, and Montréal regions. He spent two summers in a String Quartet in Residence for the Shaw Theatre Festival (Niagara-on-the-Lake) and two at the Charlottetown Festival. Why did you begin playing the violin? I started playing shortly after my third birthday. I come from a family of three brothers. My parents always enjoyed classical music and thought that it would be nice if for their 25th anniversary the three of us could play Beethoven’s Archduke Trio. So I was started on violin (and piano), my older brother on cello, and my younger brother on piano (and viola). I was the only one crazy enough to continue. Needless to say I am the poorest brother of the three. At the 25th anniversary we did perform the trio. My cellist brother has kept playing in amateur groups, and he married a professional pianist. In 1997 I began spending most of my summers in Banff, Alberta. I originally started working for a guiding company that caters to Japanese clients. This started my love for hiking and camping, which led to backpacking, mountaineering, and finally rock climbing. I still guide (hiking/backpacking) and teach (rock climbing) on occasion, but these days I mostly enjoy the outdoors on a personal level. I also enjoy billiards and skiing during my off season (just kidding?). I played French horn through high school, and I played trumpet in a legendary ska band in Montréal which included Symphony Nova Scotia principal cellist Norm Adams (sorry Norm). If you couldn’t be a musician what would you like to do? I would be a malacologist (one who studies mollusks). I like to mirror my pace of life after my malacological friends. What has been your major accomplishment to date? Climbing Mount Assiniboine (highest peak in Banff National Park). Climbing Mount Robson (highest peak in the Canadian Rockies… don’t tell my wife!). Convincing my wife that climbing Robson is a good idea (again, don’t tell my wife!! ).